WASHINGTON, D.C. — Ambuj Neupane, M.S. ’13, and Katie Saunders, M.A. ’13, share more than just a passion for service. On their own, they traveled across the country to enroll in Illinois State’s Peace Corps Master’s International program, which combines Peace Corps service with a graduate degree. They began dating while on campus for the first year of the program, uncertain if it would last once they were assigned their Peace Corps country. Coincidentally, they were both assigned to the Dominican Republic. They worked in different communities in the Dominican Republic but often made the one-day trek to see each other. Once they finished their Peace Corps service, they were both hired as program analysts at the Environmental Protection Agency in Washington, D.C. They now live together just outside D.C.
“I hope that when people hear Katie and Ambuj’s story about what they were able to accomplish through their master’s degree program at ISU, as well as their service through Peace Corps, they’ll really be inspired to do something similar themselves,” said Beverly Beyer, M.S. ’03, ’08, associate director at the Stevenson Center for Community and Economic Development, which coordinates ISU’s Peace Corps programs. Neupane came to ISU from Hawaii, Saunders from Washington State. Neupane had just finished his undergraduate degree and was torn between doing Peace Corps service and getting his master’s. The Master’s International program allowed him to do both at the same time. 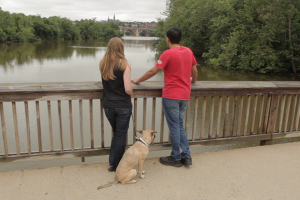 Illinois State alumni Ambuj Neupane and Katie Saunders on a walk with their dog near Washington, D.C., in June 2015. “I looked at all the programs that were out there, and Illinois State was the perfect option,” Neupane said. Through the Stevenson Center, Illinois State has a strong partnership with the Peace Corps that dates back to 1994. The Stevenson Center offers several graduate programs for returned and future Peace Corps volunteers, as well as AmeriCorps volunteers. “ISU worked for me because I was looking for something to push my boundaries and to try something different,” said Saunders, who was a youth, families, and community development volunteer in the Dominican Republic. She earned her master’s degree in the sociology program. Neupane was in the applied economics program, and he worked as a community economic development specialist in his community in the Dominican Republic. Coffee rust disease ravaged that community prior to his arrival. To help farmers diversify their crops, Neupane helped create, legalize, and maintain new avocado farmers’ associations. After less than two years on the ground, he helped get 200,000 avocado plants in the ground, as well as create a network of buyers and technical advisory contacts once the farmers were ready to sell their new crops. Neupane’s favorite moment, he said, was more personal, as he walked through his community toward the end of his service and spoke openly with residents about their lives. “I can’t explain how good it feels when you’re plopped down as a stranger, in the middle of nowhere, with no basic amenities, and you somehow manage to make a home out of that,” he said. Learn more about Neupane, Saunders, and their Peace Corps service in the video above.